Q: Let me ask you a question, MARTH? I hear you are working as a producer for a resort. I know you are a resort specialist, but what made you name this resort “Lastra Mu”? “Lastra“ of “Lastra Mu” means a stone tablet in the Italian language. Maybe it has the same root as the stone tablet of Moses‘ Ten Commandments. I also think it comes from “Las Torah”. I added “Mu” after that. Then, it becomes “the stone tablet of Mu”, which means “the spiritual book of Mu” and the stone tablet of Nacaal. They say that what is written on the tablets is everything is unknown, mystical, not this world, that everything is a manifestation of love as it is One Being with the quality of oneness as written in the Heart Sutra. It is the same as “Return to One Source” which Japanese samurais often mentioned. Therefore, it is connected with the path of the samurai. “Return to One Source” means that everything returns to the space of oneness, in other words, conflicts and separations are nothing but a dream, and the real truth is the love of oneness… I profoundly feel that it is most important to return to the true reality, to the unknown and mystical, to the love of oneness. The New Age people often call it “reality”, but the true reality strongly expresses that it is unknown, mystical, not this world, and everything is within the love of oneness. The one being means that we return to the one being, to the oneness, which is the absolute reality, when we meditate and return to Shinga and enter into death. If you experience being in Shinga itself, you will profoundly feel you are the one being, in other words, you will have a sense that you are Shinga itself… That may be the reason why some people say something strange and egoistical such as “I am God”. This may be the reason why some New Age people misunderstand their experience as they feel “I am the whole universe. I am God himself ” in deep meditation. I think, when all lives, all people return to the true and deep essence and regain the higher self (the true self), they will return to Itself. You will find that you are Shinga, and Shinga itself is you at that time. However, everybody will return there. That means that the self who you think the self will be the self for all people. I feel the whole universe is made in such way. I talked about this topic with Nezu-san (Mr. Zenko Onagi), who is a specialist of Kojiki and other Japan’s historical records. I have never read Kojiki before. He told me the same thing was written in it. Nezu-san told me everything in this world is embraced within Amenominakanushi according to Kojiki. I was happy to hear that because Kojiki reminded me of Isaiahnagid, Isaiah. And everybody is this very thing, which is connected as one, unknown and mystical in reality. All people who are purified and returned to the true self are beautiful gods, and they will be embraced by Shinga forever. I cannot but feel it is incredibly beautiful and magnificent. I think it will be inevitable for humanity to realize it. It may be the origin of the ancient Veda and all religions of the world. I feel it is loving wisdom of humanity which existed in ancient times. The ancient science may come from Shinga… That means it is different from the present science based on a value of separation of the left brain. It was the science based on a belief that everything is not a reality. It is entirely different from science based on an idea that everything is a reality. It may often be quite the opposite. The ancient science, the science of a civilization presently called Mu, and the ancient incredibly excellent science is born out of the right brain based on the truth of un-reality. It is based on that everything is unknown and mystical, that this world is not a reality. For this reason, it is natural that it deals with plasma and like a Siddha, which seems psychic when it is seen from a belief that this world is a reality. It cannot be helped that there is a difference between the New Age or spiritual scientists who have learned the science, which is rooted that the world is not a reality, psychic, ethereal, Siddhi-like, and those who have learned the science, which is the left-brain-like, based on an idea that this world is a reality. It is quite natural that the science based on a belief of reality and the one created by Socrates, Platon and other scientists who realized that the unreality is the reality, is not compatible. I sometimes see the people with such different ideas fighting each other on the television. It is certain that they end up in fighting without such awareness. However, we will enter into the time based on the true reality. It will be the time when all people realize the truth that this world is unknown and mystical, and it is not this world. Scientists being aware of it, science will be the quality of plasma, which goes way beyond the existing science. It will be a wonderful, dream-like quantum science based on phenomenons in the mystical, unknown and unrealistic world. Otherwise, humanity may be ruined because of a sense of separation. Q: I have a question for you, MARTH. I saw a poster about so-called power spot of love at the station the other day. It said that we will be overwhelmed by natural power; we will receive love vibrations and so on. I felt something egoistically wrong with is, but I was not sure what the problem is. What do you think of it, MARTH? Q: I feel you are a leader of the New Age and the healing industry, MARTH. So, I dare to ask you this question. I often hear some New Age people say that they are a reincarnation of such and such or they are chosen by God. Why do they say so? I feel religious problems come from the same source. What do you say about it? MARTH: You’re right. Unfortunately, every problem comes from our value of separation. Everybody wants to win, become better, excel others, become somebody, and he doesn’t want to lose… Not only leaders but the ordinary people have such fear coming from desires, wants and a value of separation, which makes us have such tendency. They meant no harm, but because of a belief in the self and the other, we want to improve the self and to win, never want to be looked down within the separated society of the ego. That is one of the big problems. And another important thing is, everybody returns to Shinga (the true self) when we enter into a deep meditative state. As I mentioned before, you will experience such values like “return to the Source” “Return to the one being” “this world is nothing but a dream”. Then, there will be neither separation between God and the self, nor separation between the self and some other, nor a sense of reality. You will be gone and return to the ocean of oneness. You will have no value of separation at that time. We often hear someone says “I am a reincarnation of Cleopatra or Princess Yang Kwei-Fei “. If you look closely at her, she looks very much alike her counterpart. She may feel that she is a reincarnation of a certain person with similar consciousness. However, all human beings, including those who believe in a devil, are connected as one. We are one being. If we lose the ego through a deep meditation and return to love, we will return to the one being. In such an experience, we will feel, “Alas! All things in this world are being manifested as One Being.“ Everything is the self, or there is no self, we could say. We will feel we are included in One Being. Therefore, rather than you are a reincarnation of someone in the ancient times, this ancient person reached such consciousness. This is nothing but my personal feeling. I feel this way through my past experiences of repeatedly coming back to Shinga or the space of oneness. It is neither that someone is superior or inferior to others, nor he is better or worse. All human beings, insects, birds, flowers and everything will return there. Everything is connected as one. In spite of a difference of the time, we are connected as one with the people in the Jomon era and have the same consciousness. The true meaning of a consciousness level in the New Age is shown within a range of the higher level of selflessness and the lower level of the ego. If there is someone who has reached the same conscious level as you, he can be a reincarnation of you. As everything is connected as one, there is only a difference of a consciousness level. What is most important for us to create the millennium more than anything is to return to Shinga, to the higher self, to God consciousness and to love which a child of God has… Just like the divine people in the ancient time were called a certain name of God, and like I.naghid was called God… I wonder if it is our task to return to a beautiful person. I wonder if we need to return to a beautiful person like Ra Mu, Buddha, Socrates, OSHO Rajnessh, J. Krishnamurti, Ramana Maharish. I think all of us have to return to Shinga, which is the true quality of humanity, to love, to oneness, to the one source. Isn’t it a mission for all human beings? I feel that way. If I answer your question with a personal viewpoint, I think something uncertain that you are concerned about will be gone when we return to Shinga or the oneness, and we are able to regain loving consciousness. And no people will try to win over others, excel them, not to lose, become somebody because of fear. I personally feel that human beings will experience the world of oneness, of love for the first time. subsequently to “MINOR LINE – The Road to the East” recorded in Prague on Nov. 11, 2018 (11.11.11). “The Road to the East – to make a land of love, to be a model world” is born now. The following lyrics are based on a legend of I.naghit. 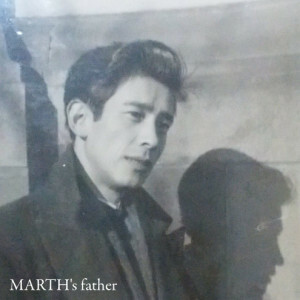 It is born after MARTH deeply accessed to the beautiful and sincere heart of I.naghit. and keep a peaceful relation with neighboring countries. My ancestors from my father’s side lived in Jindai on Awajishima Island for generations. My father raised me, giving me intent guidance according to legendary teachings of I.naghit. He was a man of sincerity and justice. He looked like a samurai who dared to risk his life for happiness of the people. My father was an officer at Ministry of Justice. In the later years, he was transferred to Tokyo Prosecutor’s Office. After he resigned his position, he said he would be a fisherman in Izu. Instead he immediately retired from the world. He had been a man of justice and beauty all through his life. He told me every day not to win over others, not to become better or great, not to boost the ego, not to think ill of others even if hurt by them, hope for friends, love them, contribute to our country and live a life, pursuing justice. who was a good friend of MARTH. He passed away due to scirrhous carcinoma (cancer). His children support MARTH as his staff now. I’m not good looking. Are you? 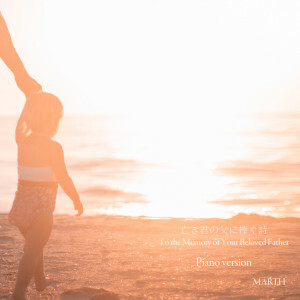 “To The Memory of Your Beloved Father (Single)”MARTH New Single is on sale on Bandcamp! Q:Dear MARTH, isn’t it good that we strengthen the ego, get enlightened, and become great? When we boost the ego or strengthen it, do we really get better? And or, how about that we reflect on us or feel sorry for others, saying, “I hurt my mom and dad’s feeling. I’m sorry I didn’t take much care of them.” “I feel sorry I didn’t love my children enough. ““I am sorry I had been defiant to my friends, to my boss, to my teacher, to everyone”? In other words, this is when we have a small ego (sense of separation). Which is happier and comforting for us, that is, when our ego is destroyed, or when we boost the ego and strengthen it? Let us call it a way to live life. Which way to live life will bring us a beautiful future? Is it when we praise ourselves, saying, “I am strong. I am great. I will not lose. I will win.” Or, is it when we reflect on us, “I ruined everything. I am very sorry. I want to apologize to my father and mother. I am sorry for my friends and comrades. “Which way to live a life is consciousness of God, of love, of the whole universe and of purity? Which is able to bring us a beautiful future? In a self-help seminar where we witness the self, we say, “What it is in the state of beginning will be there in the future.” If we keep the primary consciousness, we will realize such being exist in future. In other words, if we act out of fear or of bad intention, we will see a bad result in future. In this sense, is a state of our consciousness better when we boost the ego, feel uplifted, become self-conceited, and get irritated? Or, is our energy better when we end the ego (a sense of separation), return to the original small self or to the one source, get grounded, reflect on ourselves, ask ourselves, “I am sorry. I should have helped them. I should have supported them. I should have done this or that”, reflect inwardly and feel sorry for our mistakes and so on? And I dare to tell you that we are love, consciousness of a child of God, and the whole universe, which is the true quality of humanity only when we reflect on ourselves without boosting the ego, or uplifting it. And when we live with such awareness, we will see the present world beautiful. We return to love, the true essence, when we end the ego. We can see the world as darkness. At that time, we boost the ego; feel excited, thus we are fearful. As the ego is strengthened, fear will be bigger. A sense of separation is a sense of fear. When we reflect on ourselves, feel sorry, and our ego is diminished, we will see everyone is loving in fact whether we ride on a train or walking on the street. It is what comfort really means. hen we see our sadness with such standpoint of view, when we are pure enough to reflect on ourselves, “I haven’t been able to live in love, I fought with my friends again, I tried not to lose pretending to be tough again, I felt defiant to my rival as always today”, we will be able to return to bliss in fact. That is love and consciousness of a child of God. That is in reality the true essence of humanity. When we are there, we are happy. We will see the world beautiful. Therefore, uplifting the ego, boosting it and protecting it will not be good for the beautiful world, for the world of love and comfort. I mean to say the true essence of this world is oneness. It is connected as one, love, selflessness. It is also that we are not part but the whole. We are incredibly unknown and mystical. This is the true quality of the world. If you boost the ego, assert yourself and protect yourself in the world of oneness, your happiness, as part of the existence, will be damaged. Humanity doesn’t know it very well. If you say; “No, I won’t be a loser. I, I, I will win! I’ll be good! I’ll be great!”, you will put yourself into darkness, to an obstacle race. It is because that is against your quality of love. If you boost the ego, you will lose the quality of oneness. Love means being connected as one. And you will find peace, happiness, success, prosperity and everything in love. If you lose love, and if you boost the ego, assert yourself, protect the ego and do everything to strengthen the ego, you, as a cell, are not it, but strangely and drastically stand out. It means you have become a cancer cell or a tumor. Humanity must sincerely realize it and learn about it. It is not important to boost the ego or to make a cell bigger. It will eventually become a cancer or a bad cell. Therefore, the reason why you don’t see the world loving and beautiful is because you have identified yourself with the ego. It is not because of outer factors. It is nothing but that you have been able to see sadness not to live in love. What is truly profitable for us? Q: Let me ask you a question, MARTH. I think the world is in a great turmoil… It seems we human beings have reached limits in the existing way of life. How can we make the world better? How can we realize peace in the world? First of all, we need to change our values by knowing what is profitable and what is not for ourselves (part of the existence) in reality. Certainly, the best way is that we will live together with love and joy by diminishing our value of separation of the ego, increasing peacefulness in a sense of oneness and gradually losing a sense of interests of the ego, which is an illusion. However, we human beings are made to believe in a value of separation seriously. Simply speaking, separation means the ego (boosting the ego). Human beings and animals have come to understand a limited range as the self because of five senses given by God for our conveniences. And giving everything a name has brought us a sense of separation. In fact, everything in the entire universe is us. We, part of the existence, are given five senses to bear different part. Eventually we feel a certain range is the self. We manage to live in the universe, considering we bear a certain range, role, and responsibility of the self. It is not bad in itself. It is also true, however, that we will strengthen a sense of separation because of this understanding. It’s amazing how things work out in the universe. It will not work as we think. The universe created our five senses with which we are likely to separate and even let us separate. However, as soon as we (part of the universe) act or move separately, it will give us a hard time to awaken us. Such built-in mechanism of the universe will not give us a verbal message. It is quite troublesome. We need to be always aware of Atman, being one and connected, unknown and mystical to protect us, which is part of the existence. If we seriously believe in the ego and act according to it, have a value of competition, comparison and conflict, we will fall into a hard time because of an awakening message from the universe. It has been happening to us since the ancient times… We have engaged ourselves in believing in the ego, protecting it, preserving it and boosting it without knowing such mechanism of the universe. However, the universe doesn’t care at all. It doesn’t mind whether we humans believe in the ego and become worse. It doesn’t mind whether someone tries to boost the ego, protect it, has various ambitions, desires and aspirations. The universe will just give us a hard time when it happens. Then, we, part of the whole universe, will be stunned, say, “Wow! No, this doesn’t work! I was wrong. It’s painful. I’m not happy at all. Oh, no! This is not a good idea. Please forgive me” and return to the selflessness. This is a mechanism to make the ego to diminish, and dejected. Therefore, we will have a hard time if we don’t realize the mechanism of the universe. “Why doesn’t everything work out? I should have succeeded. I should have won.” However, everything will not work out as expected as ambitions of the ego don’t fit the whole universe. The ego is a separation. It doesn’t fit the principle of oneness of the universe. The universe will give us a hard time. And, we are the universe ourselves. “If God doesn’t find me, if the universe doesn’t find me, it will be no problem. I can deceive them…” However, we are the universe (love). We are part of God. We are part of the whole universe. That is, we as God will find us deceive them. Everybody is the same without partiality. In other words, people who realize oneness of the universe, its unknown and mystical quality, love themselves who seem others, neither fight with themselves who seem others, nor boost the ego, nor protect the ego, nor deceive people, nor trap them, nor attack them, will be quickly happy. And people of the pure heart who work for the whole universe will be beautiful and feel true prosperity and happiness… This is how the cosmic law works. However, most of human beings haven’t realized it yet. They don’t know it deeply. This is the reason why they will have a hard time. What if humanity will know the law itself? At present, humanity doesn’t know it very well. They believe in the ego, become highly ambitious, try to get a fame, honor, boost the ego, protect it, deceive others, attack them, and take from them. Believing it works in the egoistical society, people praise themselves, “I have become so great… I am so awesome! !” At that time, however, the universe will start working. He is the universe himself… He is part of God… If he says, “Nobody is watching me!” You are watching yourself, however. You are God himself. And the universe is meant only to work that way. It is satisfied with it. We are given five senses to fix us (part of the existence) by ourselves (part of the existence), to bear us by ourselves. However, if we believe in the separation seriously and consider the part as the self, we will have a hard time. They (five senses) are given to us for our mere convenience. They are only functions. It is only that each part bears each different part. nd we have each different characteristic as children of the universe. Everybody has magnificent abilities given from gods, the universe and love. However, if we use it not for the universe, nor the whole, but for the ego, and if we try to excel others, deceive them, attack them with a sense of separation, we will end our days in unhappiness. Even if you say, “I’ve got a position and honor! I am great!”, you may ruin yourself in pain. Or if you live for the ego, saying, “I will rebel those in power! I will abandon my job, seclude myself in the riverbed or home, and live freely!”, your wonderful ability given from the universe will be wasted and definitely destroyed as its retaliation.